Perma Rust Remover is an aqueous green liquid which removes the rust and forms a protective cover around the reinforcement and other steel members. Perma Rust Remover is just brush applied on the metal surfaces. it is an essential pretreatment to the re bars before starting. Perma Bond SBR or Perma Bond - AR treatments. it is also a pretreatment to steel before any epoxy or Polyurethane coating. 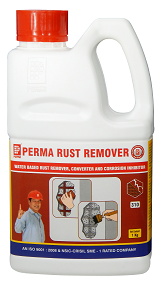 Perma Rust Remover is used to remove rust from metal surfaces and reinforcing bars. treatment of steel with Perma Rust Remover is a pre requirement for further anti corrosive repairs and epoxy coatings. Packing : 100ml, 1 Ltr, 2 Ltr, 20 Ltr, 500 gms, 10 kg, 30 kg & 120 kg.